I like mantas and I like diving in beautiful places. I have already seen mantas in three locations including this one and in every place is it quite different but the gist is the same. 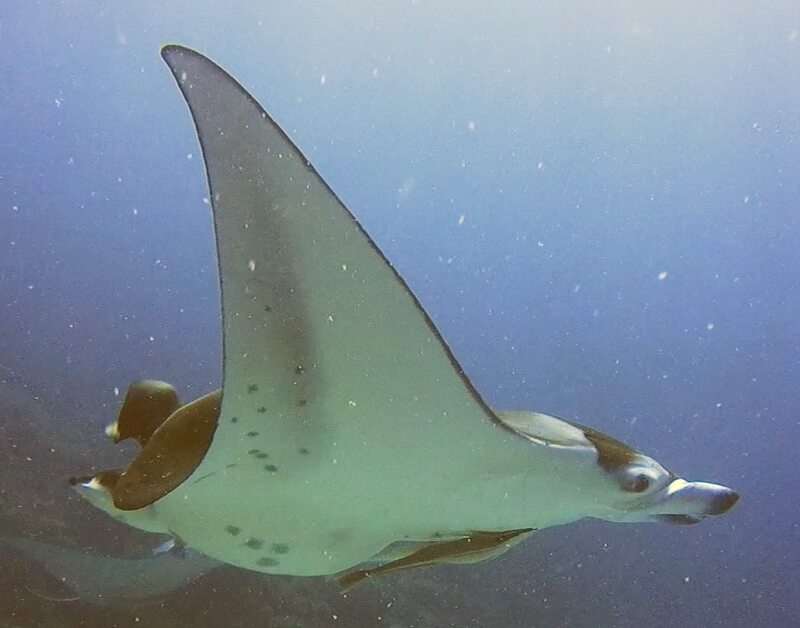 Mantas need to go through cleaning stations and usually, if a location has a stable population, once a cleaning station has been located then you are almost guaranteed a sighting. Of course, these are wild animals so for whatever reason, they might not be there at the time you go so the window of opportunity is actually small when diving with mantas in Bora Bora. In the Maldives, I saw them but it was a rather harsh dive. Currents were very strong and I had to literally hug a coral not to we swept away. For the one and only time I had to come up half way through the dive because the current was too strong and it was taking me away. So I saw them, but it wasn’t pretty. I was excited about Bora Bora because mantas are inside the lagoon so waters are pretty clear and very very quiet. I was not disappointed. After a few minutes under water staring at hard corals and small fish there they were, in all their splendor. I love mantas. They are beautifully gentle and so elegant. For such a huge animal they are extremely elegant and subtle in their movements. They glade as if they were sliding along a toboggan. They pass by you, slowly and sweetly, they are such amazing creatures. Despite their size and curiosity to see divers I was never afraid of them. Each manta is unique and can be identified by its belly spots which are unique. In Bora Bora the cleaning station was right in front of the hotel so it was a short 5min boat ride, bliss. Located between Mount Otemanu, the Four Seasons and Intercontinental Thalasso it is just off the end of the lagoon so waters are quiet and very clear. In this case we were extra lucky. One of the mantas was pregnant and you could spot its huge belly. Also, there was a very playful one which was enjoying swimming up and down in successive V-shapes. Very pretty. If you want to come down there with me, watch this shot video and get transported to Bora Bora waters.